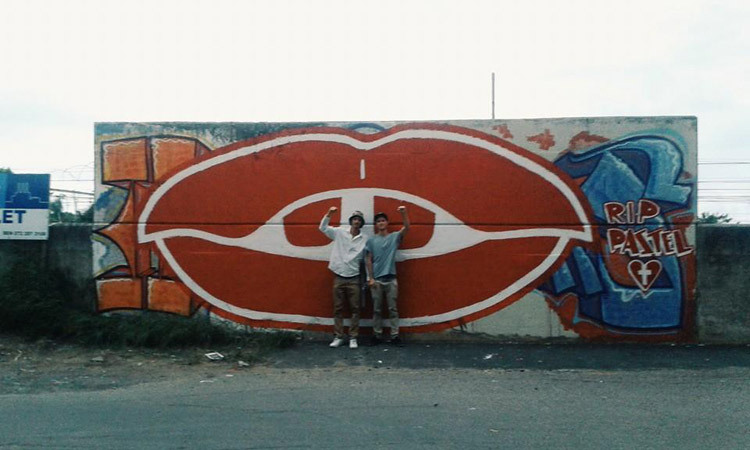 Mook Lion – graffiti writer, Durban street art pioneer and master fine artist – will be rocking steady at Zakifo on Saturday 13 June, adding some jungle style to the Tomy Custom Kicks project! 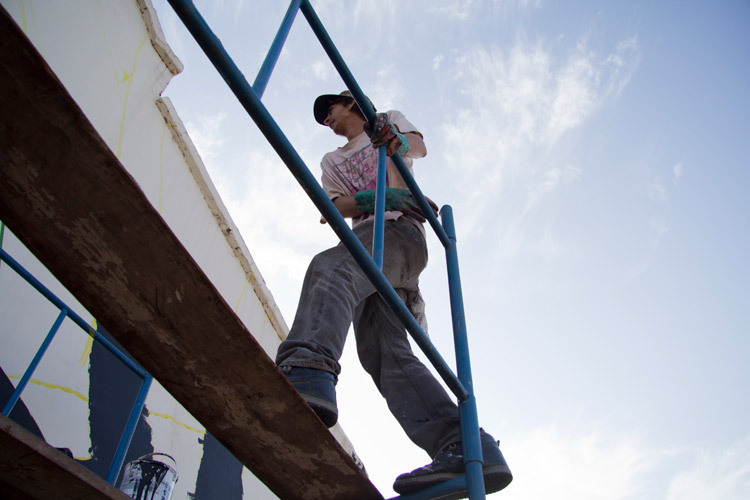 Mook will be joining Delon ‘4Givn’ Moody, Skye T Steen and Dokter Jah Irie, who will all be painting huge canvasses live at Zakifo Muzik Festival. This art real estate will be purchasable – as each canvas will later be shipped off, chopped, sewn and glued into artist series Tomy Takkies which you can own! The investment will cost you R250 and all proceeds go to HOLAH Baby House – a home for orphans, located in Glenwood. 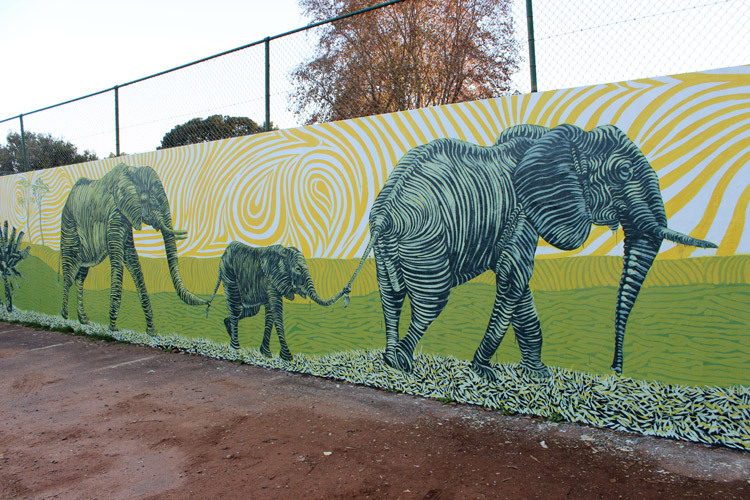 Mook’s murals are big, bold and colourful and his artwork has a naive, vibrant quality that uplifts the energy of the environments he paints. 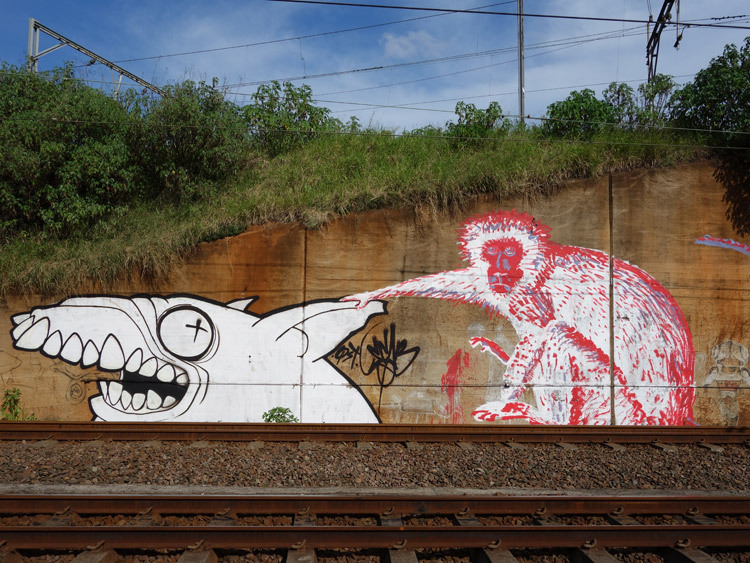 His graffiti style is psychedelic and expressive. When you look at his pieces you feel like you’re being sucked into a carnival. His art truly is an extension of his personality. 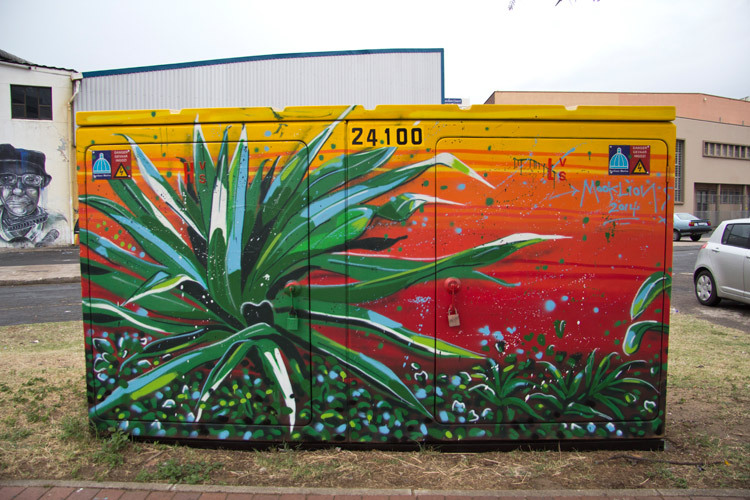 “I aim to make art that has a positive impact on society by beautifying or re-purposing wasted space and communicating with the public,” he explains. 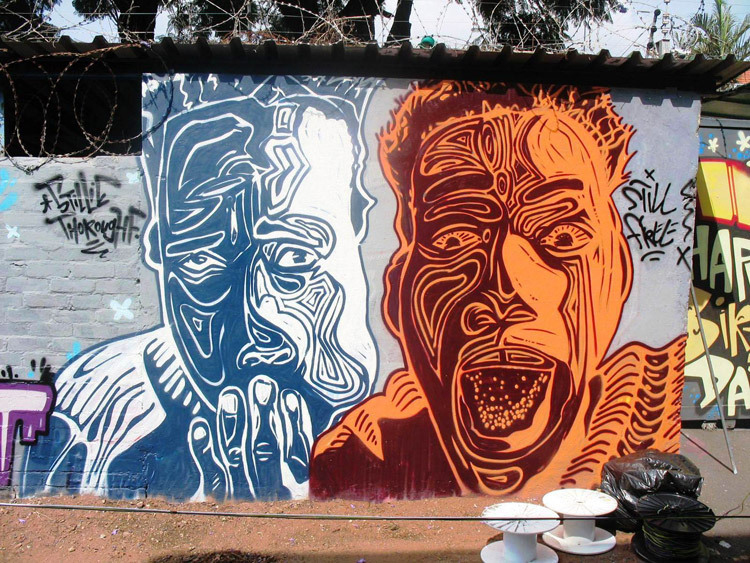 Mook’s street art reflects a classic lino-cut or wood-cut technique, which has a strong tradition in South African art making – a style that he applies to his murals, wheat pastes and graffiti. 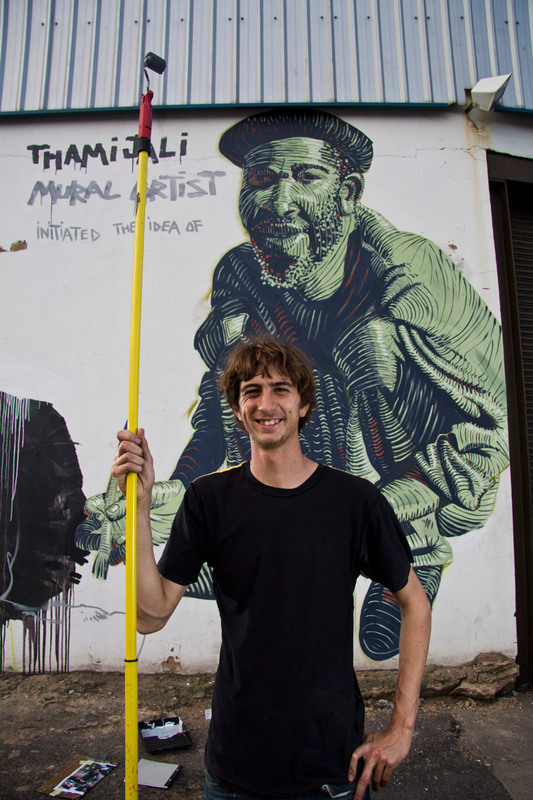 In his thesis, he is investigating street art and mural art as examples of social activism with the use of Durban as a case study. 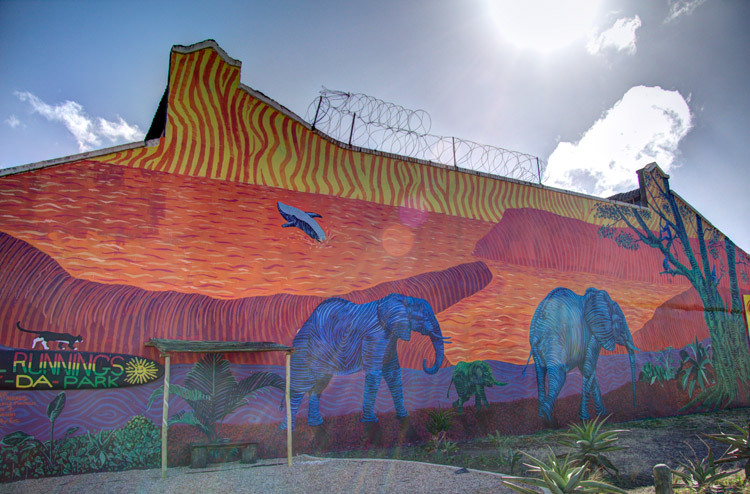 “My study is practice-led, with the aim of producing site-specific and socially conscious artwork in the public domain,” he explains as we take drive past a monster 20 metre high mural of Durban as it would have been before civilization engulfed nature, painted by Mook and his team of four artist (Kev Seven, Sakhile Mhlongo, Tyran Roy and Sphe Mnguni), who make up Ourspace Murals. 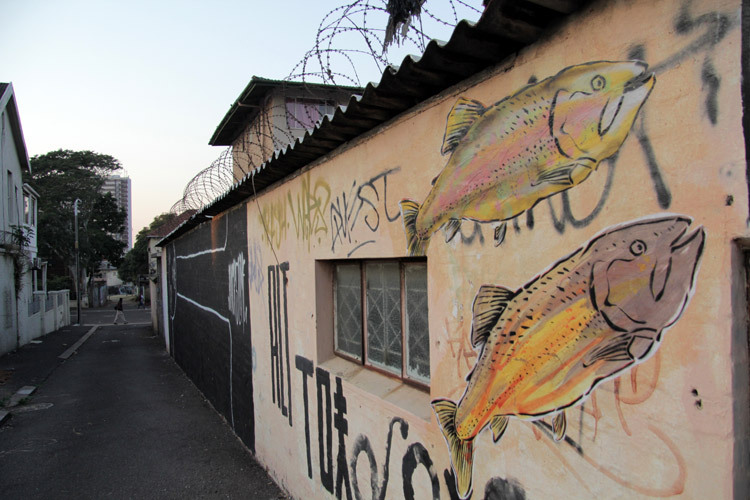 He’s recently expanded his repertoire of animals to include baboons (which he pasted up in Cape Town) and fish, which have been swimming swiftly into the back alleys of Durbs. What can peeps expect at Zakifo? Mook Lion, Skye T Steen, Delon ‘4Givn’ Moody and Dokter Jah Irie will be painting this Saturday 13 June at Rivertown Beer Hall, Durban. All proceeds from the Tomy Custom Kicks project will go to HOLAH Baby House – a home for orphans, located in Glenwood. 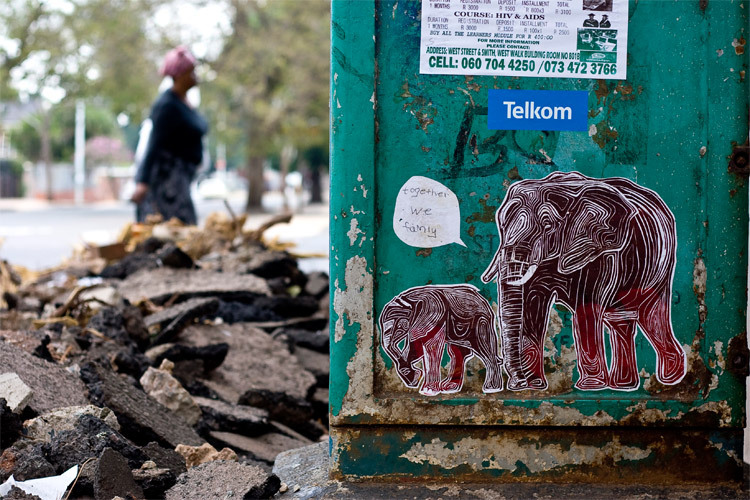 Elephant wheat paste, 2015. This is a collaboration with Blessing – the inclusion of the speech bubble aims to encourage public participation.  “Together we famly” reads the text. 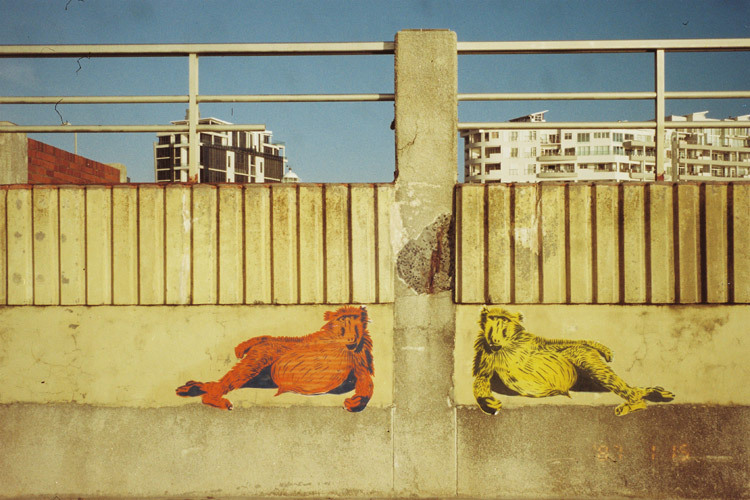 *Images Mook Lion, Samora Chapman Robyn Perros & Nicola van Straaten.